Konrad von Abel’s teaching focuses on the music phenomenology developed by Sergiu Celibidache. It aims at helping each musician to establish a direct contact with music through the observation and free listening of sound phenomena unhampered by conceptions and conventions. Classes consist of phenomenological discussions in the morning, chamber music practice in the afternoon, and work of the conducting students with a string quartet, instrumental ensemble or choir in the evening. 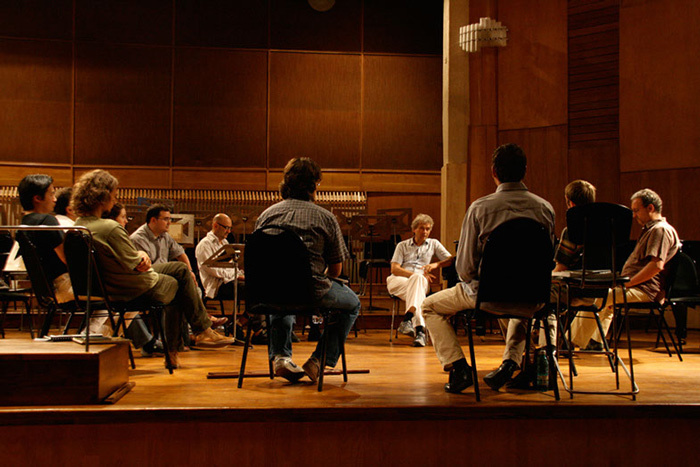 The Master Classes are organized around three to four pieces. Participants are asked to familiarize themselves with the scores of the pieces selected for this class as they will be used as support for the theoretical work in the morning as well as for the conducting classes. Students have experienced that the teaching of Konrad von Abel is not reducible in taking part in classes and lessons. All the striving of knowledge and skills about music will lead to nothing as long as one doesn’t get in touch with what we call the “inner laws of music”. In the nature of this subject teaching and learning happens so to say permanently. In addition to this you will find dates of events and schedules for the next months. Included are concerts of Konrad von Abel with extensive orchestra rehearsals. Participation is most warmly recommended. In this context a rehearsal is more than just a preparation of a concert but a research of the laws mentioned as above. The challenge is to not be lost in a concept as it is easily the case when trying to explain musical phenomenology. On this page we offer the possibility to witness this approach based on Sergiu Celibidache and will regularly provide related texts, video and audio.